As the day of August 15 draws to a close I thought I would pose a few thoughts about this date in history. 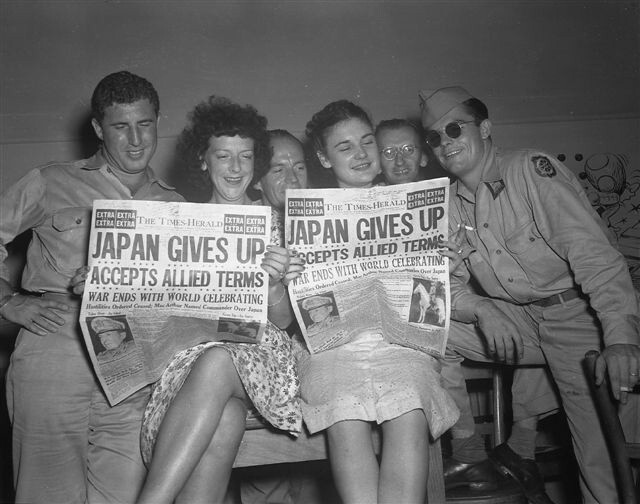 For many of you, August 15 is know as VJ day, Victory over Japan. We celebrate this day for the significance of the surrender of Japan to the Allied forces at the end of World War 2. Another significance of this date, if you are a member of the Church of Rome, is that this day is a Holyday of obligation, celebrated as the Assumption of Mary. For me, August 15 has a much more personal significance. August 15 is the date of my father’s birth. He was born in Lincoln, IL on August 15, 1923 and he would have been 88 years old today had he not died at a much too young age of 59 in 1983. While I cannot certainly change history, I can take a few moments to consider what I have learned about leadership from my dad. I hope you can bear with me as I do this. My dad was the middle child in a family with 4 girls and one son. If you are really sharp you will figure out that he had two older sisters and two younger sisters. I hope this makes sense. As the only son he had the opportunity to have “free reign” throughout much of his life and his friends have shared many stories about his youth that are quite humorous. When he was just out of high school he determined that he was about to be drafted so he chose to enlist instead. When he did enlist he chose to join the United States Marine Corps, the toughest and most demanding of the armed forces in our country. He enlisted in 1943 and then spent his 21st year in a place that most young men could never dream of, Iwo Jima. If you have no concept of this island in the South Pacific I would encourage you to watch the movie “Flags of our Fathers”, based on the book of the same name. It will give you a sobering picture of one of the most horrendous places ever created on this Earth. He also spent time on Guam and was fortunate to return home after the war with no visible scars. Every one of his sisters married a man who also served and they all came home in one piece also. Our family was extremely blessed in this respect. Like most of the men and women from that era, he returned to his normal life and said very little about the war. I suspect there were times when he remembered, how could he not, but he never made an issue of it and he lived his life with lots of gusto and flair until cancer took him way too early in 1983. I am not going to take the time to elaborate on most of these today, but some of them should be obvious in their relevance when you read his story. I will come back to this post later this week and get into more detail about how some of the five have played a role in my life.